Dictionary.com defines Taoism as “the philosophical system evolved by Lao-tzu and Chang-Tzu, advocating a life of complete simplicity and naturalness and of noninterference with the course of natural events, in order to attain a happy existence in harmony with the Tao.” (Taoism) Basically Tao literally translates into English as the way or the path. Being a professed Transcendentalist, this idea appealed to me as I made my move to Korea. It conjured up images of a society that blended together with nature to create a new harmony between these two opposing forces. I was told of hiking trails in the hills surrounding the city of Seoul that within seconds would make you feel like you were out of the city. Tales of a community that enjoyed the outdoors was regaled to me on numerous occasion before I took the flight over. I was going to a country that loved skiing, hiking, and camping. How could I not look forward to this. Even in one of the largest cities in the world, I would be able to find nirvana just by walking out my front door and finding peace among the trees that surrounded me. Even though there is some truth what was explained to me, what I built up in my minds rarely lives up to that expectation. Over the recent Thanksgiving holiday, I had the chance to go on a “camping” trip with people I work with at my school. It was suppose to be an opportunity for us to gather together in a remote part of South Korea, and celebrate the holiday with the people who have become our family out here. The head of the experiential education program set up a place for us for this adventure. It wasn’t necessarily camping because she had rented out a whole pension for those who had signed up. 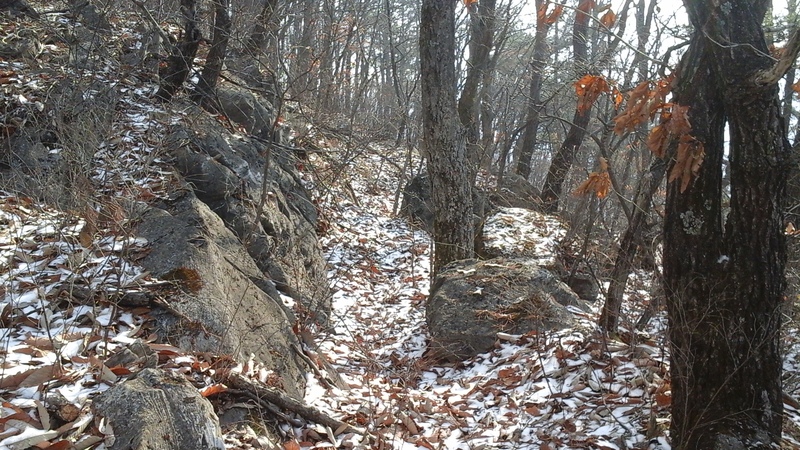 It was located in a beautiful part of the country called Peyongchang. The pension itself is a series of cabin like rooms that overlooks an amazing river and is close to a cave that you can explore next to some wonderful hiking trails. It wasn’t exactly my idea of camping but then again it was cold outside so there would haven’t been as many people willing to come if they had to spend the night in tents. The first snowfall of the season confirmed their beliefs that this was the way to go. The pension rooms definitely lived up to the concept of Taoism. There was not a lot added to the room and we were given the bear minimum in order to make ourselves comfortable. There was a thin pad you unrolled on the hard floor to sleep on. They also provided you with a pillow and a comforter to keep you warm. The small kitchen had one electric burner, and one gas one. They did supply us with a canister of propane, even though we never used it. They did give us enough plates, chopsticks and spoons for four people. Luckily, we had five people sharing the room, but we made it work. The whole layout required us to get very comfortable with each other and there is some to say about that. It still wasn’t roughing it. Some of the others who came along might have thought that it was truly out in the wilderness because there was no Wi-Fi connection which for a younger generation would be like going back to the dark ages, but once again this was something that I really appreciated. It forced all of us to take those extra steps to talk with each other instead of hiding within our electronic devices. It still wasn’t this connection with nature that I was hoping for or used to. I wanted the feeling that I had gotten away from signs of humanity and could enjoy the natural way of things. How was I able to be in harmony with Tao if wherever I looked there was some sign of human interaction? Even on hikes up in the hills behind the pension, it was hard to escape from these signs. Now I have been on many hikes during my lifetime in the mountains of Colorado, and I have run into cairns many times on these hikes. 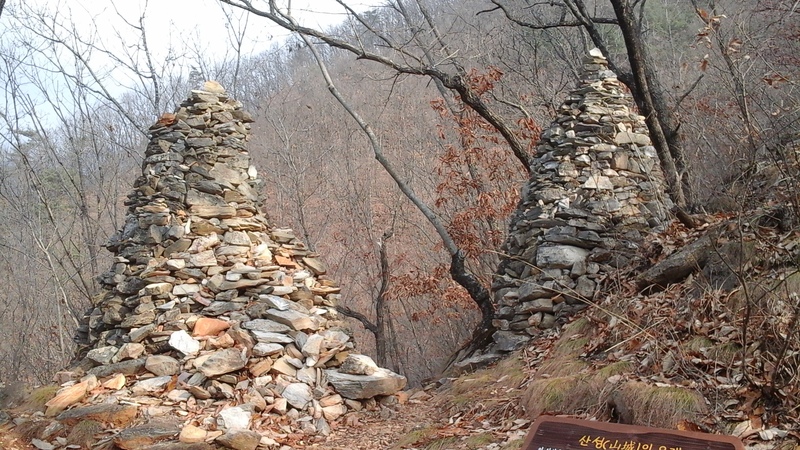 They were small stacks of stones to help guide you on your hike so you wouldn’t get lost. I know that they would be considered signs of human interaction, but they are easy to ignore as soon as you find them because they will blend back into the environment. 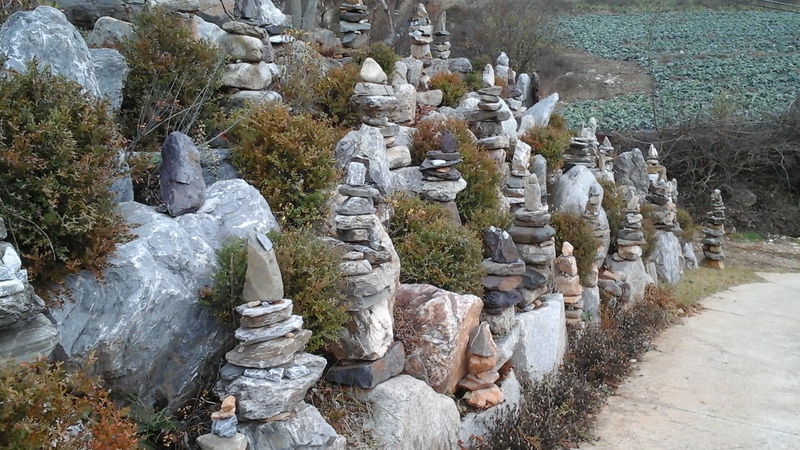 The cairns I ran into on the hillsides of Korea were a little different. They weren’t stacks of five or six rocks to help guide your way, but instead a large stack of stones that obviously took more than five minutes to put together. In fact this labor of love looked more like an archway welcoming you to the rest of the trail rather than a few guiding markers. It was impressive to look at, but it instantly reminded me of the fact that I was now in one of the most heavily populated areas of the world. As I have mentioned before, it might be because I have been spoiled by growing up in Colorado and have been able to experience those moments of extreme solitude that when I see a sight like this I automatically think of those moments and wonder why the rest of the world can’t preserve the nature that is around them instead of trying to enhance it. Does it make me antisocial to want to have these moments where I enjoy the world for myself? Would you claim that I am being selfish for not wanting to share it with anybody else? Do I expect to find comfort in only what nature has to offer me instead of what mankind can prove it can do? I think back to Taoism and revel in the fact that the way cannot be perceived the same for everyone. There should be no guidance along the path because only I can find the revelation for myself. The paths that I found in the hills of Korea contradicted this idea in my mind’s eye. I voyaged back down to the pension and this idea that Korea had about camping disappointed me a little bit. I know that not every culture tries to experience things in the same way and they have their own take on things, but still I couldn’t help to think that maybe, somehow, Korea had gotten it wrong in this case. The connection with and the struggle against nature is what camping should be about and not this moment where you go out there to relax in it and enhance it. I didn’t spend too much time worrying about it though because I only had a short break off from work and one of my favorite holiday traditions was asking for my attention. That night the folks from my school gathered together in a large hall in the pension and everybody brought a couple of dishes to share. We gathered around the table, stuffing our faces with the traditional fare as well as some new items that were brought from people from other cultures. We shared stories, we laughed, and eventually somebody brought out a guitar and we sang together. It wasn’t a new experience for me, but I felt at that moment a joy I hadn’t felt in many years. It was the same joy I used to feel on Thanksgiving Day when I gathered with my extensive family, a feeling of love and kindness. Glasses were raised and for the first time out here in Korea, I felt like I belonged to something greater. It was euphoric. It was a collection of individuals brought together to create something special that would endure forever. It was in harmony with everything around me, and yet I could feel that it was always there to begin with. Maybe it was the Tao that I was searching for in the first place. I came to a realization that day that when looking for what is important in life, I shouldn’t look for what I expect to find because what that is never truly existed. Instead I should take in what is given to me and enjoy it for what it is worth. That is the place where I will find something special, and I need quit searching for it. Maybe that is what is meant by finding the way. So even though camping in Korea is nothing like what I am used to, I am still able to find a new truth through the experience that I wasn’t able to find before. Maybe instead of looking for the power of nature, I should start to look for a way that I can live in harmony with it. Even though nature’s beauty has a lot to offer, like a thousand rocks brought together, and fifty strangers gathered, there can be an enhancement to that beauty that makes it a greater marvel than what it started out being. I take that living as a hermit is out of the question? Good post!